A former information technology (“IT”) employee of the online travel company Expedia consented to charges brought against him by the SEC for insider trading in which he was found to be trading ahead of news announcements. 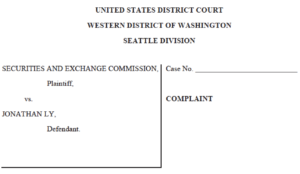 In its court Complaint, the SEC charged Jonathan Ly with insider trading related to Expedia’s publicly traded stock. Specifically, the SEC asserted that Ly was found to have been illegally trading ahead of news announcements related to nine corporate news releases made by Expedia between 2013 to 2016. The SEC alleged that Ly exploited his position as an information technology specialist, which granted him administrative access privileges, to hack into Expedia executives’ computers and e-mail accounts. With this access, Ly was able to examine confidential documents, including e-mail discussions and pre-earnings reports. One of the accounts belonged to Expedia’s head of investor relations. It was supposedly targeted by Ly because it contained reports related to upcoming earnings announcements and discussions about how the securities market might react to the reports’ information when they were publicly released. Ly then used this information to make personal trades in Expedia stock in advance of the Company’s public announcements (i.e., trading ahead of news announcements). The SEC accused Ly of obtaining approximately $350,000 in ill-gotten gains from his hacking and trading ahead of news announcements scheme. Additionally, the U.S. Attorneyʼs Office announced criminal charges against Ly in a parallel proceeding.